Thanks to our resident Photo journalist, Tom Turner, we're very lucky to have "Jacks Canning Lesson" captured in pictures! 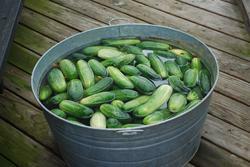 The morning started off with Jack & I picking cucumbers and green beans in Jacks garden adjacent to our farm. We stood at the edge of the garden and evaluated the crop. Then unloaded the bushels, buckets and baskets from the pickup. Our full head of steam and abundant energy gradually settled into a rhythm and cadence as we talked across the rows about growing up, our kids, family, places we've been, and adventures had as we picked and picked. The sun was warm, the beans were plentiful the and cucumber vines were prickly! When the bed of the truck was packed with the harvest we headed back to our farm and the outdoor kitchen Jack had set up on the back porch. 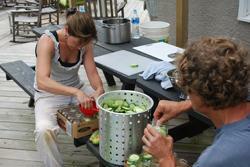 Me, Mom and Mikelyn were under Jack's watchful eye as the lesson began...rinse, cut, chop, repeat! Talk about focus! The knives were sharp and his pickle recipe was bubbling on the Colman stove. The air around us smelled sweet and sour. When we weren't laughing we were totally on task, each of us a member of the production line... It was a wonderful day! A big thank you to Jack for the excellent instruction and good time, Tom for the pictures, Mom & Mikelyn for the help and Wade for staying out of the way !